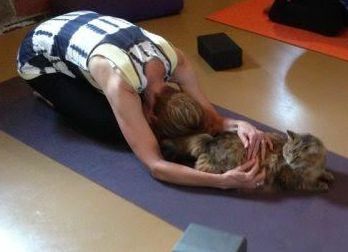 Would you invite shelter cats into your yoga class to practice alongside your students? That’s just what teacher Connie Pease did at her Illinois yoga studio, Yoga at Connie’s. The event, which was in partnership with no-kill Homeward Bound Pet Shelter (HBPS), was organized this June in an attempt to promote Adopt-a-Cat Month—as well as get cats out of the HBPS shelter and into the environments of potential adoptees. “It gives these cats exposure and shows their personality. I think people can envision these pets in their home easier because they're outside the shelter,” HBPS recently told The DoDo. Since pet yoga is on the rise (DoGa being one example, along with the multitude of videos featuring yogis and their pets that have gone viral), a move like this doesn't seem like such a bad idea either. "It gives these cats exposure and shows their personality. I think people can envision these pets in their home easier because they're outside the shelter," HBPS recently told The DoDo. Personally, walking into a room full of cats would be a dream come true for me. Yoga or no yoga, my motto is “more cats, please!” Taking care of myself (thanks, yoga) combined with the additional bonus of helping others (like these little fuzzballs) sounds even better. Naturally, I was curious to know more. 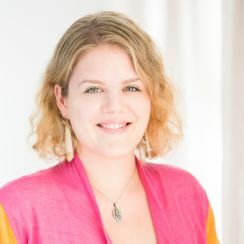 Check out the conversation I had with this innovative studio owner, which features highlights from the event itself, why Pease thinks cats are natural “yogi-masters,” tips for yogis who'd like to get involved, and so much more. How’d you come up with the amazing idea to welcome shelter cats into your studio? Actually the idea came from one of my yoga students, Jeanette. She volunteers at the HBPS and after a Thursday night class, she approached me about it and coordinated the event with the shelter. Since this was Adopt-a-Cat Month, I thought it would be a great way to give back to the community and have some interaction with my favorite animals (which happen to be cats!). We only had one week to prepare. The studio was responsible for organizing the students, contacting the local newspaper (Herald & Review), and gathering donations—as well as organizing a social hour afterward where we could talk about the experience. Jeanette was responsible for the kitties, social media, taking photos, and video. And we got some great footage! I didn't even know Adopt-a-Cat Month was a thing, so I've certainly learned a lot! What outcome did the event have? My students came together and raised $500 for HBPS. However, unfortunately, there were no adoptions (even though that’s one of the biggest reasons we held the event). But I feel encouraged to host again, and I’ve also been contacted by other yoga studios who heard about the event and are now interested in hosting one like it! In that respect, it was a huge success! It would be great to see more studios host shelter cats! What advice would you offer them to get started? Contact your local pet shelter and see if they’d be open to it. Next step? Get the word out. I contacted students with a personal invitation (but only the students I knew loved cats) and advertised on social media. The volunteers from Homeward Bound Pet Shelter were also there, in studio, and that gave the event a lot of credibility. And remember, this is not only a great way to help animals, but also an opportunity to give back to the community. People are generally looking for ways to share their kindness and this gives them a really fun and creative way to help others (and, in this case, cats!). How many cats were involved? How did they react? Also, what response did your students have after the class was over? We had six cats in the studio. Three of them were very active in the practice and the others just watched. Breezy, a black and white female, had a bubbly personality and she was definitely the star. She interacted with just about everyone. She’d walk by asking to be pet and she’d lay on the mat, under their downdogs, relaxed and happy. She brought so much life to the practice. Everyone loved interacting with the cats, too. We stopped often during the practice to hold our new furry friends. It felt really natural having them in the studio. Cats are natural yogi-masters! Breezy, a black and white female, had a bubbly personality and she was definitely the star. So true. I’ve had the same feeling, and particularly because I also have a cat-friend who loves to “practice” yoga with me. Whenever I unroll my mat, he suddenly appears. (Though most of the time he just sits, watches, and sometimes falls asleep.) What’s your take on their yogi-powers? For one, they’re always stretching! They stretch their torsos, extend their legs, pull their upper bodies up, or twist their bodies to achieve a level of precision that many people like us can’t. And their purr!? Cats do diaphragmatic breathing without even thinking about it, and they do it so well. They’re also so mindful and focused. They’re practically always concentrating on something or other and holding it deeply within their awareness. They’re always glancing out the window at a bird or a flower. They seem to be able to hear and see every little sight, every little sound. Really, I think we could learn a lot from them about presence and nonattachment. Cat’s don’t need our approval; they’re just themselves. They just are. And what about your purr-sonal practice? Do you have animal friends at home you yoga with? Yes! I have Maggie (my dog) and Midnight (my cat), and when I am out on the deck, we all practice yoga together. (Both were featured in our Adopt-a-Cat promo video, in fact.) It’s a nice way to bond. Maggie lays next to the mat, waiting for a hug, and Midnight is on the mat, always jumping on me, walking down my back, and kissing me while I'm in cobra pose. Ever since the event, I’ve thought about how sweet our shelter cats were. If I could have brought each and every one of them home with me, I would have. They’re amazing animals.